Iraq has captured a suspected Al Qaeda cell that planned to produce chemical poisons such as mustard gas to attack Iraqi forces and to ship overseas for attacks on Europe and the United States, the government said on Saturday. The announcement was made as investigators look into allegations over the use of sarin nerve gas in next-door Syria where rebels and President Bashar al-Assad's forces have blamed each other for using chemical weapons. During the height of the Iraq war, Al Qaeda in Iraq used chlorine gas in its explosives to poison areas where their bombs detonated and Saddam Hussein used chemical gas to attack Iraqi Kurdish villages in the north. 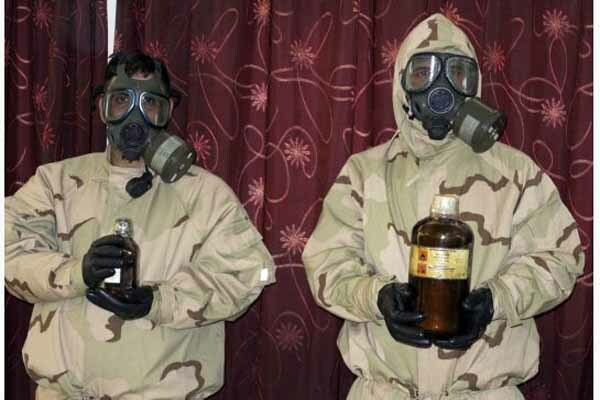 Five men were caught before they could manufacture any gas or chemical weapons in makeshift factories in Baghdad and another province, Mohammed Al-Askari, a defence ministry spokesman told reporters. "They got some programmes from al-Qaeda outside Iraq, they were working ... to produce mustard gas ... and other gas," he said. "There are some confessions about organised cells to smuggle them outside Iraq through a neighbouring country in order to target Europe, America and different capitals." Officials showed reporters three suspects dressed in yellow jumpsuits with their heads covered by masks. They also displayed bottles of chemicals and other lab equipment as well as remote controlled toy helicopters authorities said the men planned to use to disperse the gas. Bolstered by the Sunni Muslim rebellion against Assad in Syria, Al Qaeda in Iraq is regaining ground and since the start of the year has stepped up its campaign of attacks to stoke sectarian conflict in Iraq. Western powers, including the United States and Britain, say there is growing evidence of chemicals weapons use in the conflict in neighbouring Syria, where fighting has killed more than 80,000 people in two years.